Remember when a band used to play and suddenly everything would go soft focus and everything but the players would go dark? Of course not, because even I have only seen that happen in Grease when an angel visits the girl in the diner and basically calls her a complete reject (did anyone else find that weird? ), but I imagine that it used to happen all the time. I imagine there was a certain kind of crooner who could strike one chord on a stage and all the light in the room would go pink, and all the members of the band would be backlit like models in a 1950s knitwear catalogue. I guess that’s what they call star quality. I’ve never seen it before, but they sure talked about it a lot in Fame Academy, and so when I saw this band The Wave Pictures in Birmingham last week, and suddenly the light in the room felt like it was coming out of a Super 8 camera, I was able to figure out why it was. I’ve now seen them play four times. Each time there was a song that I didn’t recognise, or something they’d written new that day, no mean feat when you appear to be playing a different show every single night. And then I spoke to them and I realised they have no idea how good they are. Not a clue. And they don’t know who CSS are, and they’ve never heard The Maccabees, and they live off a diet of Chuck Berry and Jonathan Richman, but occasionally sing the filthiest lyrics you’ve ever heard. Like first there’s a surfs-up guitar solo, and then there’s the line “And then you got cystitis, didn’t you?”. I don’t know, maybe I’m like an idiot girl in a poodle skirt swooning over a matinee idol, but I’ve never fallen in love with a band like this before. It’s like discovering The Mountain Goats at their first show, or getting hold of the first Belle And Sebastian tape and getting to tell the weirdo who sold it to you that you like his band. You know the people who get interviewed because they were the first Neutral Milk Hotel fans? Well, I get the feeling this article has written me into at least a book or two about The Wave Pictures. But that’s a few years down the line yet. At the meantime they’re on tour with Darren Hayman and about to release a single on Moshi Moshi. A four-week residency at London’s the George Tavern starts on Tuesday November 13 and continues on November 20, December 4 and December 11. They also seem to be playing everywhere else, all the time, for the rest of their lives. Here’s your chance to DiScover The Wave Pictures. The singer, David, did most of the talking, ‘cause the other two got really shy. We had to force them even to nod their heads. How dreamy is that? Though some of us are only discovering you now, you’ve been together almost nine years. Tell me about life so far. David: Well, Franic, who plays bass, and I grew up in a village called Wymeswold in the Midlands and we started playing in a band when we were 15. We had a singing drummer and mostly played covers. Then the drummer left, I went to Glasgow to university, and Franic went to art school where he met Johnny who plays drums now. We used to meet up every now and again to play a show, and then a year and a half ago we moved to London to live in a flat together and started playing lots of shows. That’s quite a lot of moving around the country, do you feel like your experiences of different cities has a had an effect on your songwriting? I guess so, but it's not like I wrote obviously Glasgow-y songs in Glasgow or now write obviously London-y songs in London. The way I think about making up songs isn't to do with locking them into anything quite that specific and frankly I'm not a good enough writer to do that. But, those different places will all have had very different feelings and I'll have hung out with different people in them and the songs that I was writing in them will all have been correspondingly different. It's more like the way I would write a different sounding song if I was hung-over or a different sounding song on the piano. You all live together now. Has it had a big effect on the function of the band? Yeah we don’t really like each other anymore. We used to really enjoy playing and hanging out and rehearsing and now these two just spend all their time on their mobile phones talking to other people, and we have nothing to say to one another. That’s the main effect that it’s had. Care to add anything guys? Maybe you could say “Franic shakes head”? Franic: Franic shakes his head. When I spoke to you after your last gig, you said you didn’t feel attached to the British music scene. Is there a particular crowd of musicians you feel connected with? David: There are some people in London, like Darren Hayman, who we like to do stuff with, and some people we’ve toured with, but not really. I don’t think we’ve been anywhere where we found a ‘scene’ we really like. I don’t think we like ‘scenes’ very much. We grew up in the country where there was nobody else playing music. But you do find in any scene some bands that you like, but never everybody all at once. There are a lot of musicians in New York that we like, like Prewar Yarsdale, Jeff Lewis, Kimya Dawson, Turner Cody, lots of people but we don’t like everyone in that scene and we’ve only spent about two months there. You’re quite a storyteller in your songwriting. Surely not all those thing have happened to you? No, of course not. A lot of it’s made up. If it had all happened to me I would be really fucked up. That’s from an interview I read that someone else did, so it’s kind of like a cover. Can you do a cover of someone else’s interview answer? I think that’s called plagiarism. The recordings on your next album are quite rough. Is this a statement on your part? We just wanted to do it live. You get a certain something when you get a whole band playing live that you don’t get if you do everything separately, and the things that you lose by doing that in sound quality weren’t things we were too bothered about losing on the first record. And all the artists you mentioned before share a similar recording ethic. Do you think because you don’t look for a really clean studio sound in other people’s music it’s not that important in your own? Yeah, that’s a part of it. Also an awful lot of the old music we listen to sounds like that. Like if you listen to Chuck Berry the sound quality is lower than what it is on our new record. Like the idea now that everyone’s record has to sound like U2 is a slightly strange idea. The album doesn’t sound that lo-fi to us, it just sounds like what old rock and roll sounds like, and like you said, the indie bands that we listen to now. You’ve recorded a lot of albums already, haven’t you? Yeah, about five or six records, which we sold as CD-Rs at shows and sent to people. So you’re like old pros in the studio. Well most of those were recorded at home, but recording in the studio is just the same. The main thing so far has been just to capture the live feel. It took a few days to record 26 songs, then we mixed them for a week, and chose the best 13. You seem like one of those bands who have always done things their own way. Now that you are signed to a label do you see things changing? How ambitious are you? Yeah, but not in a way that’s necessarily bad. Moshi Moshi are nice guys for a start and I don’t think music is ever the result of a single vision, it’s always a collaboration of different people. The Wave Pictures is never exactly how I would want it, or Johnny would want it or Franic would want it anyway, then when we record it with Simon [Trought, also recorded Darren Hayman’s album] it becomes something else again. Certainly Moshi Moshi would never makes us do anything we really don’t want to do, and it doesn’t feel bad so far to include them at all, or let them make some decisions. So are you guys ambitious as a band? How far does your ambition take you? We are ambitious, and in a way that seems really obvious to us. There's nothing about us that wants to be shambling or humble musically. We'd like to make records that sound as good as Creedence Clearwater Revival, or The Rolling Stones, and we like trying to do great sounding guitar solos and drum rolls and all that stuff. I'd like for lots and lots of people to hear us, and to do interviews and be photographed, it’s just that it isn't our priority. It isn't what we think about too much. I don't even know how all the tools of promotion work and I’m not that curious about it, but I'm happy to meet all the people who want to help us, and grateful to them all. You’ve packed in a lot of experiences for a band about to release their first official single. Do you want to tell us about it? Okay, erm, we’ve recorded with John Darnielle at a festival in Paris a few years ago, done a lot of recording with Herman Dune, who are good friends of ours. We’ve also served as backing bands for Jeff Lewis, Turner Cody, Darren Hayman. I play in a bluegrass band with Darren as well, and we’ve just recorded an album. We’ve been really lucky – we’ve met a lot of people, a lot through Herman Dune. They just got hold of one of our CDs and really liked it, and they introduced us to a lot of people who they’re friends with. You’ve played a lot in other countries. Is it important to you to play internationally? Is this something that’s important to you or do you just enjoy it? They’re the same thing. It’s important to us because we enjoy it. I’d like to travel more and play and go to everywhere that you can play. 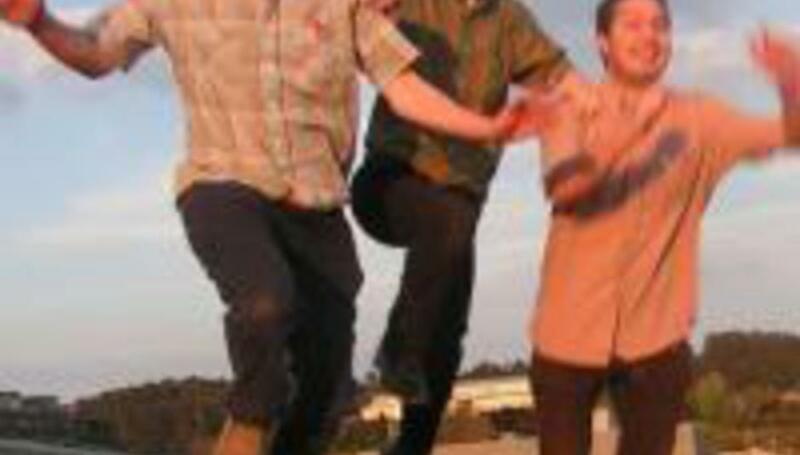 What are we to expect from The Wave Pictures after the release of the album next year? Lots of shows I guess, more recording. We have lots more songs to release and we’re writing more all the time. Some tours hopefully. Just more of the same, and we’d like to put a pedal steel guitar on some of our recordings and maybe play some shows with Dan Mayfield on violin. You’re about to start a four-week residency at the George Tavern…what’s it all in aid of? I think it’s just going to be nice to play the same place all the time, it’s a nice bar and it’s near our flat. Isn’t it to support your single? Oh yeah – to support our single, which is coming out on November 24. I think it’s the 26th. Yes. We’re releasing a single on November 26 called ‘We Dress Up Like Snowmen’ backed with ‘Now You Are Pregnant’ and so that’s why we’re doing the residency at the George. [Laughs] You know, I had never put that together until just now; I just thought we were doing it because it would be fun to play in the same bar where you were the main thing that was going on. I should have known that, shouldn’t I? Finally, there’s quote on your website from David Herman Dune describing you as “one of the best band playing nowadays on this planet”. Did you twist his arm very hard? Um, no, I think he really thinks that. You could never persuade him to say anything he didn’t believe and uh, he’s really a man to be believed and everything he says is important, and… I think the world should take notice. The Wave Pictures’ next show is at the George Tavern on Commercial Rd, London, on November 20. Their new single is out on November 26 through the Moshi Moshi Singles Club. MySpace.